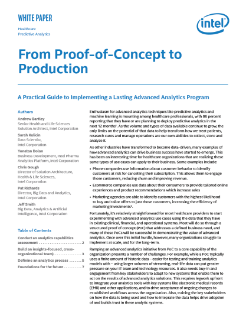 A practical guide to implementing a lasting advanced analytics program, this white paper looks at the steps needed to support analytics in healthcare. Many different elements need to work together to ensure analytics solutions are created to support successful business insights. Several methodology components are also needed to ensure the right business focus, data workloads, and data processing ...are developed for successful implementation of a healthcare organization’s analytics solution.